If you’re reading this post, you’re probably aware of all of the wonderful things infographics can do for you and your brand. How they help people retain information easier. How they look so great. 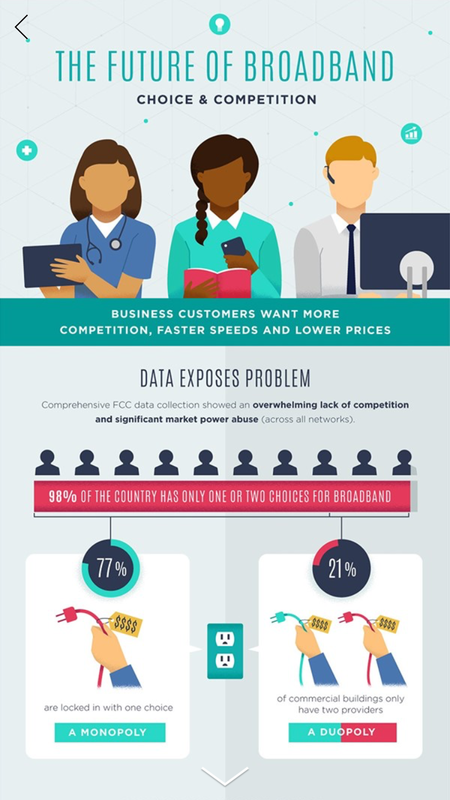 Unfortunately, full infographics do not look so great on Facebook. Sigh. Have you ever seen a sad infographic sitting in the newsfeed by its lonesome? It’s gut-wrenching seeing it sit there all by itself, surrounded by white space, no one able to read the interesting information within it. TL;DR – DO NOT UPLOAD YOUR FULL INFOGRAPHIC AS A PHOTO TO FACEBOOK. Your audience won’t be able to read a thing. Feeling sad for those poor infographics but don’t know how to fix it? Luckily, we have a few options and alternative ways to promote infographics specifically on Facebook. 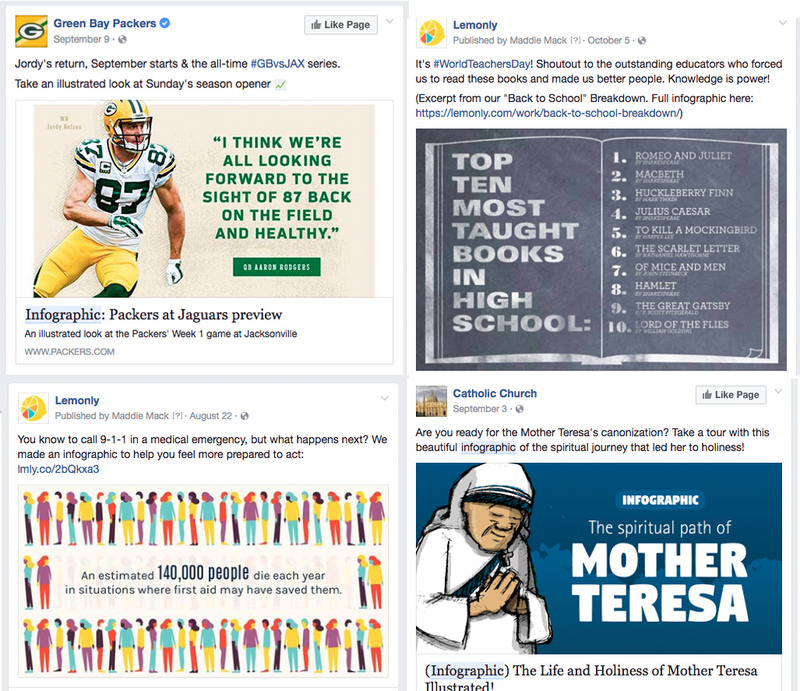 As a brand page, there are plenty of options for how your infographic can be uploaded to Facebook. Currently, these are what pop up on our page as an option for sharing an image. One thing to note is that whatever post type you choose, you should be sharing only a portion of your infographic. Its home should not be only on Facebook. Your infographic should live on your website, your blog, or another page that properly can host your infographic and let people read it with ease. 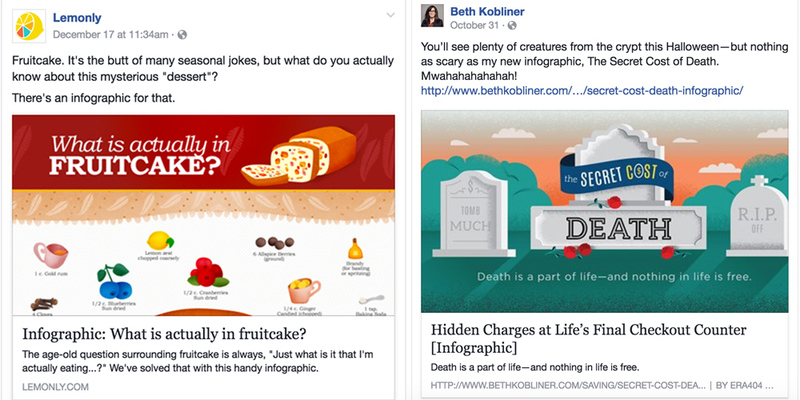 Facebook should be used as a vehicle to share your graphic, not house it. 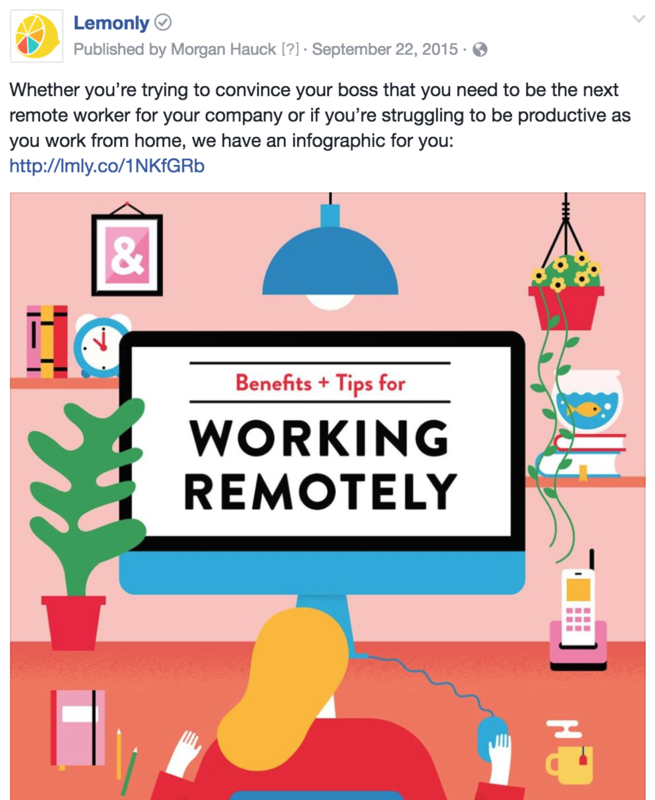 Facebook should be used as a vehicle to share your infographic, not house it. Remember that when showcasing a portion of your infographic, try to crop a visually compelling portion, like the header of the infographic or a section with a compelling stat. Whether it’s horizontal, vertical, or square, Facebook will determine which dimensions it uses to show your image. When showcasing portions of our infographic, we tend to do square or horizontal images. If you upload a square image it will display as a 470-pixel square, the maximum allowable size in a Facebook feed. This will be the case no matter what size square you upload, but note that images smaller than 470 pixels might appear a blurry or pixelated when they are sized up. If you upload a horizontal image, it will be scaled to 470 pixels wide and the height will be adjusted accordingly. Horizontal images smaller than 470 pixels wide could appear at less than the 470-pixel width, aligned left with whitespace to the right of the image. If you upload a vertical image, it will be scaled to a height of 394 pixels, aligned to the left, with white space to the side. The adjusted width will be relative to the 394 pixels. For instance, if you upload a 500 x 700 image, Facebook will resize it to 281 x 394 pixels. Within your Facebook post promoting your infographic, signal to people that more content is there so that if they find your image interesting, they know to click the link to learn more. Do you have multiple parts of your infographic that you want to preview to your audience at once? A carousel can be a great way to show a few pieces in a fun, interactive way. When any of the images are clicked or tapped, your website with the full infographic will automatically open. You can also customize the copy below each image, too. Note that carousel images are square, so we suggest creating your images at 600 x 600. Here is an example of how we used a carousel to preview a few parts of our 2015 annual report. 2018 Update: Facebook no longer allows pages to upload custom thumbnails to crack down on the whole fake news thing. While you USED to be able to upload a custom image on a shared link, that’s no longer the case. Make sure on the back end of your website, you have a custom thumbnail for your Open Graph Tag. Here’s a great post that goes more in-depth on that, if you’re unsure about how that works. We use the Yoast SEO plugin to do that on our website. For maximum impact, create your preview image at 1200 x 628. The nice thing about sharing a link with a customized thumbnail is that when the thumbnail is clicked, it will automatically redirect the reader to the full piece on your website. Here are a couple different examples of customized thumbnails when sharing links. Canvas is the newest and most customizable post type for brands to experiment with. One thing to note is that they’re currently only viewed on Facebook’s mobile app so your desktop viewers won’t see or have the same experience for your Canvas post. 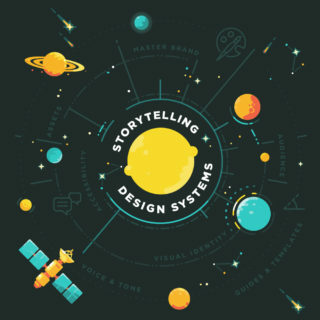 On mobile, you can upload a longer portion of your infographic (or perhaps your full infographic if it’s not incredibly long) into a Canvas post since it’s made for mobile and vertical. You can link the infographic itself to the full graphic on your website and also place a CTA button below your infographic to link to the infographic on a website. We’re still experimenting with Canvas but are incredibly excited about the opportunities for customization. Here are the things you can insert in a Canvas post. 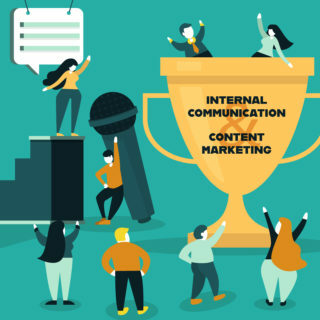 When adding either a portion of your infographic or your full infographic to a Canvas post, we suggest selecting the “Fit to Width (Linkable)” option so you can customize the URL of where people will go if they click your image. 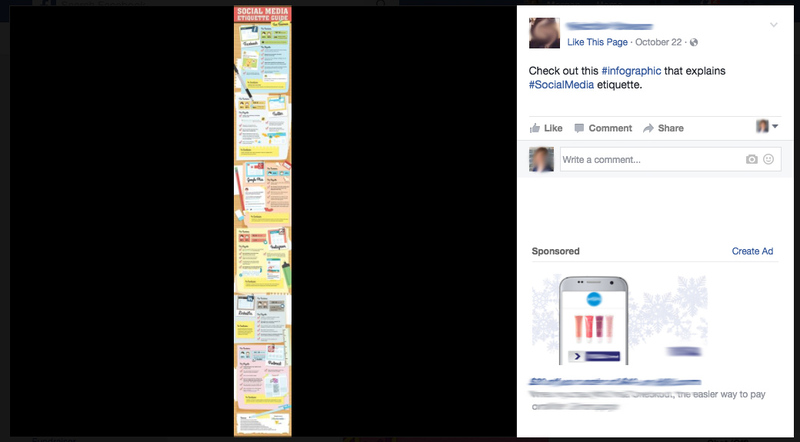 Below is what a full-width infographic within Canvas looks like in the Facebook app. Note that users aren’t able to pinch to zoom so your copy will have to be sized large enough to view on mobile. Remember to share your infographic multiple times. You (or your agency) spent a lot of time creating it, so be sure your audience sees it! Leery about doing that? Read more about sharing content multiple times on Buffer’s blog. Share different portions of your infographic at different times. 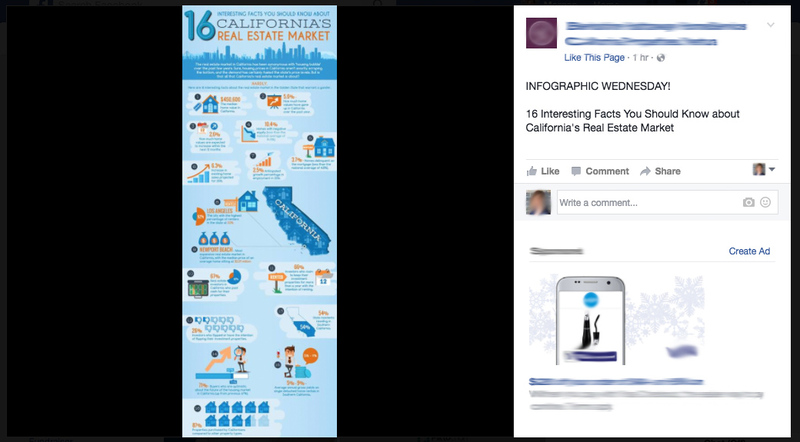 Try sharing your header in one post one day and a chart within the infographic the next. Sometimes you’ll be surprised by what resonates most with your audience and makes them want to click on to read your full infographic. For more tips on sharing your infographic on different social media channels, check out our eBook on Microcontent here. 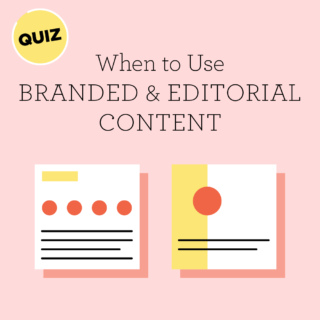 Need help with how to post your infographic on your website properly? Check this post out.